Gabe recently had rotary cuff surgery on his shoulder and it all happened while playing the great American sport of baseball. The tension was high from the dugout as not one man had scored a run…yet. As soon as that ball was hit, eyes turned to Gabe as he came flying through third base, eyes focused straight on home. From the dugout, men in dripping sweaty t’s with faces pressed against the fence were screaming from the top of their lungs, “Home! Home! You’ve got this, Gabe! Come On! !” Sure enough, that ball came soaring from the outfield to home. Gabe came crashing home, sliding in hands first as the catcher leaped forward to catch the ball and then came slamming down…on Gabe’s shoulder. It was painful, and he heard something pop, but he scored one for the team. Well, the only one for the team. They lost that day…15-1 and although he felt a bit victorious because of that run he didn’t realize how much damage had just occurred. I feel a bit foolish, ignorant really. I didn’t realize the extent of work that was going to be needed on his shoulder and had no idea that a rotary cuff surgery is one of the most painful to undergo. I honestly assumed Gabe would walk in and out and be back at it the next day with only a sling to remind us of his procedure. Wow, was I ever wrong. Immediately after his surgery, he was in pain…intolerable pain. He needed my help, round the clock. Being that he was on pain medication for the first week, I made sure to feed him lacto-fermented cultures to keep his body regulated. I fed him a lot of milk kefir, plain and in smoothies, lacto-fermented pickles, and a ton of vegetables including a lot of dark leafy greens. He ended up not needing any sort of laxatives as real food did its job of flushing out the toxins from the medication and re-introducing healthy bacteria his gut was screaming for. I was more than happy to tend to my husband but I was left exhausted. Praise God my mother in law had made us a couple of meals to get us through the week and then I pulled out one of my favorite super quick meals to make during those times that you’re literally left with no wind. This meal is made so quickly because I used a frozen bag of fire roasted peppers and onions from Trader Joes, farm crafted sausages, and einkorn penne pasta from Jovial. Now I know peppers aren’t organic or homemade but since I’m all about grace, this is what we needed during this season in our lives. And… like most things at Trader Joe’s go…it was tasty too. If you have a bit more time to cook in your kitchen you can make your own fire roasted peppers at home by broiling them in your oven like I do here. For those times that you literally need supper on the table in minutes, this is a meal you must try! Sausages, Peppers, and Onions Over Einkorn Pasta. A simple and quick weekday meal that your entire family will enjoy! Bring a large pot of water to a boil and add 3-4 tbls of salt or until it taste of the sea. Add the pasta and cook according to the package directions. While the pasta is cooking, in a large skillet or cast iron pan, brown the sausages on all sides; 8-10 minutes. Once browned, to the pan add 2 tbls of extra virgin olive oil, the peppers and onions, and 1/2 tsp salt.Cook with the sausages, turning every 3-4 minutes until the sausages have cooked through; 12-15 minutes. Once the pasta has cooked and been drained of water, add the spaghetti sauce to the pasta and mix through. 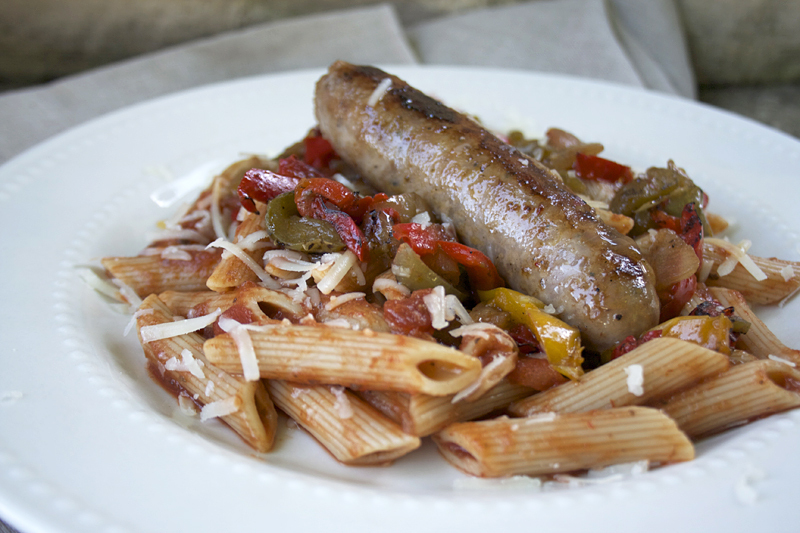 Serve the pasta topped with peppers and onions, and a farm crafted sausage and garnished with pecorino romano cheese. Praise God, Gabe is on the up and up. After the first week, he’s doing so much better and off his pain meds. Also…as a reminder, Jovial Foods has once again partnered with My Humble Kitchen. Stop on by their online store to pick up all of your einkorn needs as they have once again offered My Humble Kitchen readers 10% off PLUS FREE shipping by using the online coupon code, HumbleK. So, what’s your favorite way to eat sausages, peppers, and onions? What are your favorite quick and easy meals to make when you’re out of wind? Please share with us any recipes or links in the comments below. Thinking of Gabe and wishing him a full and speedy recovery. He’s got the best nurse by his side. I hope that your hubby heals soon. Remember: this, too, shall pass. That reminder usually helps me during a stressful time. I would agree with you that grace is key! I just made a dinner like this last week, except that I used potatoes instead of pasta. I usually use brown rice pasta, but thank you for reminding me that I want to try Einkorn. One of my quick “emergency” dishes is pasta with a white sauce, canned chicken, and frozen peas. We will also sometimes just have a “snacky” dinner of salad, popcorn, or smoothies. Thanks for the recipe!